There is little doubt that more fish will be lost during the fight when a barbless hook is used. With a barbless hook there is nothing to prevent the hook “falling out” of a carps mouth, in fact the only thing keeping the hook in, is the presuure on the hook via the tension on it through the line. Carp can very quickly “learn” that by twisting around during the fight and thus making as many different angles between itself and the line in its mouth they can often shed the hook. Be in no doubt that from the moment the hook catches in the carps mouth, its sole objective is to get rid of it ! This has been shown on the Korda DVD’s with very pressured fish even trying to get rid of the hook before running off, which is their primary instinct.When a carp reaches a weedbed it can shed a barbless hook in seconds because it has something to use to create an angle and a slack line. I have experienced this many times myself and watched it happen countless times. I’m not saying it happens every time because sometimes the hook has such a good hold in the mouth “that was never going to come off” ! With a barbed hook the barb keeps the hook in the flesh of the mouth and even a slack line will not cause the hook to fall out. Although from the catch point of view this is good for the angler, it has consequences for the carp in situations where the carp is not landed. In weedy waters where the fish lodges itself in a thick weedbed the fish will remain hooked and this results in a situation where the angler, in trying to pull the carp out from the weed, puts tremendous amount of pressure on the fishes mouth with consequent damage.If a fish is lost due to line breakage and especially where something other than a safe rig is being used, the fish will have great difficulty in shedding a barbed hook, if it is towing a lead around as well it will be almost impossible. The same can be said when a carp with a barbed hook, line and possibly a lead, tries to find sanctuary in submerged snags. I remember many years ago Brian Sefton who was manager at the Carp Societies’ Horseshoe Lake telling me that when the snags were removed from the corner of the lake known as “snags bay” several carp skeletons were found, fish that had become tethered and died a slow death. If like me, you have some respect for the carp that you fish for, the least that you can do is to think beyond your own desire to catch carp and consider these facts before deciding on what type of hook you use. For fishery managers the same applies when deciding on the rules of the fishery. Many fisheries seem to have decided one way or the other on an arbitrary basis “because so and so says barbed hooks are safer” or because “that lake down the road has a barbless rule”. The argument in favour of barbed hooks as far as I am aware is that they are safer because they “don’t move” or “don’t tear” during the fight. Where this originally came from I don’t know but as far as I am concerned it is absolute nonsense and has no basis in fact. Most damage to a carp’s mouth in my opinion occurs not during the fight, but when the hook is removed by the angler. This is the single most important fact in this debate. There are times when even a barbless hook can be difficult to remove and I am sure most carpers will have experienced this. 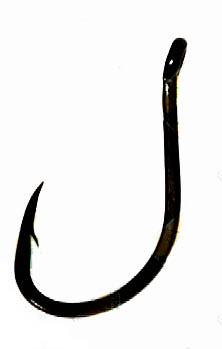 The hook has a hold in a particularly hard or grisly part of the mouth and takes a lot of force to remove. If this were a barbed hook, then a significant difference in the amount of damage caused would occur. With barbless hooks the hook often falls out “in the net” and again I’m sure everyone has experienced this, I have heard people say “oh I nearly lost that one” or similar, but the fact is that the pressure on the line has kept the hook in the carps mouth, and when that pressure is released the hook falls out, often aided by the different angle on the hook in the net. On French Holiday lakes such as ours here at Les Croix the level of ability of the visiting anglers varies from novice to very experienced in my mind when you have such a variation in ability, a barbless rule is the only way to ensure that the carps mouths stay in as good a condition as possible.I’m sure that most experienced carp anglers hate to see carp with badly damaged mouths, I know I do. Unfortunately there are those who do not care at all about the welfare of the carp but hopefully they are in the minority. In summary, I can’t see much if anything in favour of barbed hooks apart from the fact that less fish will be lost when using them. On waters where the damage has already been done and there are numbers of carp with no sides or corners of their mouths left due to hook damage, carp will be lost on barbless or barbed hooks because there is nothing for the hook to catch on ! The only situation where I could see the argument in favour of barbed hooks would be on a syndicate water with experienced carp anglers only, fishing a snag and weed free lake. As I said earlier, if you are going to fish for carp and put the fish through the stress of being caught, the least you can do is act responsibly and treat them with a little respect, and that includes thinking about the hook you are using. This entry was posted in Guest Articles and tagged angling, barbed, carp, Carp Fishing, carp fishing france french angling lakes lake venue venues waters catfish holiday holidays, Carp Fishing Tips, catfish, fish, fish care, fishing, france, french, holiday, holidays, hooks, lakes, Reels, respect, tackle, tench, venues, winter. Bookmark the permalink.